Wright is responsible for research and product development across the full spectrum of energy storage solutions at Johnson Controls. She has also served as vice president and general manager for Johnson Controls’ hybrid systems business, and CEO of Johnson Controls-Saft, which under her leadership became a leading independent global provider of hybrid battery systems. 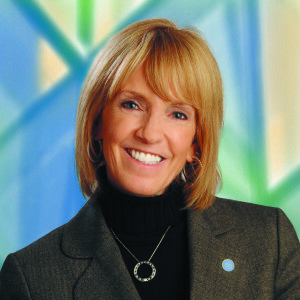 Prior to joining Johnson Controls, Wright was executive vice president for engineering, product development, and commercial and program management for Collins & Aikman Corp. headquartered in Southfield. She began her career at Ford Motor Company in 1988 and held a variety of positions in finance, product and business planning, and engineering. As director of sustainable mobility technologies and hybrid vehicle programs, she was responsible for all hybrid, fuel cell and alternative fuel technology development. She served as chief engineer of the 2005 Ford Escape Hybrid, the industry’s first full hybrid SUV, and led the launch of Ford’s first hydrogen-powered fuel cell fleet program. Wright has a bachelor’s degree in economics and international business and a master’s degree in engineering from the University of Michigan, as well as an MBA from Wayne State University.